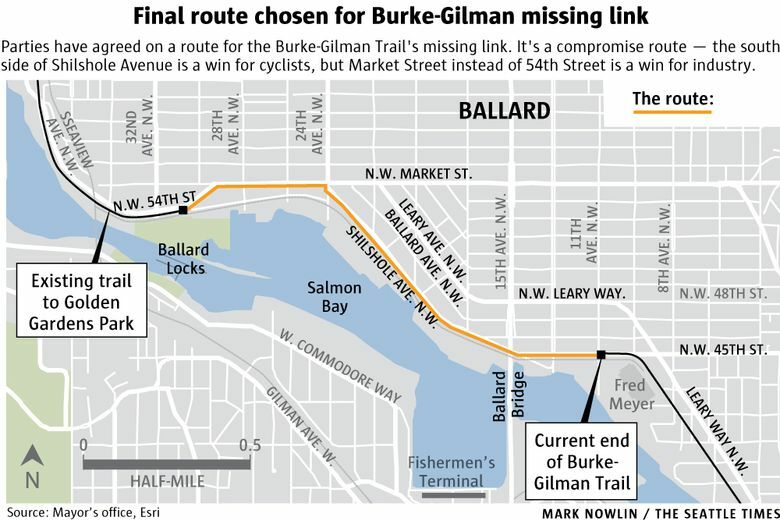 Seattle has announced an agreed-upon route for the missing link of the Burke-Gilman Trail, ending decades of dispute between the cycling community and the Ballard maritime industry. After more than 20 years of disputes, Seattle’s biking community and Ballard’s maritime industry have agreed on a route to complete the missing link of the Burke-Gilman Trail along Shilshole Avenue through Ballard, Mayor Ed Murray’s office announced Tuesday. The 1.4-mile gap in the walking and biking trail, between the Ballard Fred Meyer and the Hiram M. Chittenden Locks, will follow a compromise route — along the south side of Shilshole, as cyclists preferred, and then along Northwest Market Street, as industry preferred, instead of 54th Street. The Burke-Gilman Trail runs for 18 miles beginning at the north end of Lake Washington before it abruptly stops in Ballard, pushing bikers onto trafficked streets veined with railroad tracks, before the trail resumes at the locks and runs to Golden Gardens Park. 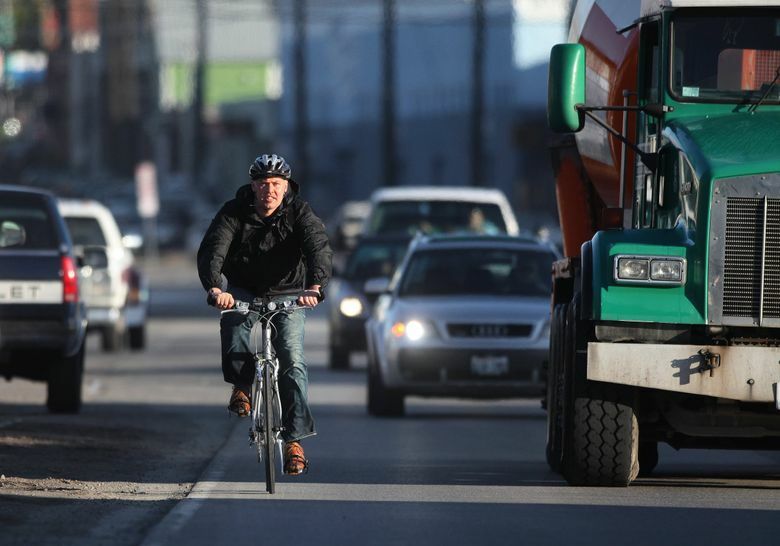 The dispute about where to route the missing link dates back to at least 1996, with cyclists and pedestrians pushing for the more direct Shilshole route, while industry argued that putting the trail on Shilshole would disrupt truck traffic and be unsafe. “Bicyclists and pedestrians will no longer need to weave, dodge or hold their breath while navigating through Ballard and maritime businesses along the water will maintain access to the roads they depend on,” Murray said in a statement. About two weeks ago the city Department of Transportation narrowed the options for the missing link down to two routes that both used Shilshole, after years of debate in which industry preferred alternate routes along Ballard Avenue and Leary Way. The final route, which chooses Market Street over 54th, bypasses Ballard Oil Company and other businesses located on Salmon Bay. Likewise, cycling advocates won a big victory with the trail on the south side of Shilshole, and compromised in the choice of Market Street over 54th, which would be more direct. Still, the trail won’t be built tomorrow. A final environmental impact study — following a 2008 environmental review and a draft environmental impact statement released last summer — is expected to be completed in May. The city Department of Transportation said two weeks ago that it is committed to beginning construction sometime in 2018. As the environmental impact study is completed, stakeholders will work to agree on design elements of the trail. Eugene Wasserman, president of the North Seattle Industrial Association, which long opposed the Shilshole route, said he’s OK with the final route.